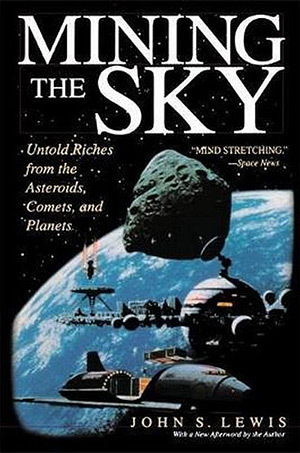 Mining the Sky is one of the most important books space advocates can own because, as the author puts it, “we must address economic issues, or there will be no future space activity.” However, this is not an economics text. John Lewis, a planetary science professor, provides scientifically backed arguments for using space resources to address problems on Earth. We are in the same situation we were when the book was published, with added burdens of terrorism, culture wars, and increased energy costs. Lewis’s most important ideas are that we use materials and energy from space (in the form of space solar power) to reduce the resource crunch here on Earth. This work has never been timelier. Every chapter begins with an excerpt from a fictional “future history” textbook, in which the reader “looks back” at how the solar system was won. This is a fun touch for science fiction fans and “humanizes” the science for the novice reader. Starting with the comets and asteroids, Lewis first discusses chondrites or “stony” asteroids that are comet nuclei that have had most of their volatile gases blasted out by the sun. Once processed, chondrites can contain up to 20 percent water in clays, up to 6 percent organic matter, and carbonate and sulfate materials. Such organics are invaluable for life-support systems and soil for off-Earth habitats. Lewis notes that about a quarter of the mass in the near-Earth asteroid population is water, which can be separated into hydrogen and oxygen to fuel spacecraft. When people think of mining, they usually think of metals or coal. Iron asteroids are “about 99 percent metal with the composition of a natural stainless steel.” Whoever mines and markets materials from a metal asteroid might become very rich. Peter Diamandis paraphrased Lewis at the 2006 International Space Development Conference when he exclaimed, “There are twenty-trillion-dollar checks up there, waiting to be cashed!” This $20 trillion figure is based on Lewis’s calculations of how much a metallic asteroid (3554 Amun) would be worth if it was sold at current market prices. In orbit, Lewis presses for solar power satellites (SPS). He suggests building many of the components of SPSs in space, thereby reducing the amount of material needed from Earth and increasing space-based commerce. Lewis doesn’t regard the Moon as a good source of resources, except space solar power. “The biggest single drawback of solar cells, then, is the need for storing two weeks’ worth of power.” What about stationing solar cells around the lunar equator? I wondered. He states that that “would do away with the new moon dead-time problem, but of course the duty cycle of the system would still be 50 percent.” Lewis misses the point that, while the overall system would be operating at 50 percent capacity, it would still be operating continuously and no longer require batteries or nukes. Lewis is similarly negative about using helium-3 from the Moon to power fusion reactors, as he states, “The concentration of helium-3 in regolith is actually astonishingly small (one ton of helium-3 for every one hundred million tons of regolith.” Lewis suggests that it would be better to scoop helium-3 from the atmosphere of Uranus and then describes a way to do it! He next turns his attention to Mars. Lewis supports in-situ resource utilization (ISRU), but doesn’t accept Robert Zubrin’s approach of bringing along hydrogen to combine with carbon dioxide in the Martian atmosphere. He believes that the equipment needed to store hydrogen cryogenically would be too expensive. Instead, Lewis recommends searching for Martian water in the ground. With all the complicated digging, grinding, and separation equipment needed to obtain water from Martian rocks, it might be easier to store the hydrogen. However, Lewis did not state where he would set up his mining equipment. If such an extraction system were set up near the Martian North Pole, he might find all the water he needs. Lewis is also against full-scale terraforming of Mars. While he seems to have no problem with partial terraforming, he believes it is “arrogant” to completely remake Mars and instead believes human beings should “meet the planet halfway” and genetically modify ourselves to survive on a partially-terraformed world. Given the other activities Lewis proposes (moving Phobos and Deimos, building a space elevator), this attitude seems paradoxical. Unfortunately, many of the activities described in the book will not be practical until launch costs to Earth orbit decline by an order of magnitude; yet Lewis mentions the issue only in passing. Perhaps someone else will need to write a similar book on launch costs. Lewis has a lot of great ideas, but they require incorporation with others. Still, it is Lewis’s capacity for imagining a greater whole that makes Mining the Sky an important book. While others address smaller pieces of the puzzle, such as Mars, Moon, or L5, Lewis describes activities across the solar system along with a fully functioning space economy. Mining the Sky is worth reading because it provides a justification and roadmap for incorporating the material and energy resources of our solar system into our world’s economy; and economic arguments may be the most long-lasting justifications for expanding our civilization into space.